Welcome to Sky The ultimate weather app for pilots, by pilots. This visually stunning and feature rich application provides you with all the weather information you will need when you prepare for your next flight s and s with a twist Sure you can get s and s everywhere, but you'd be hard pressed to find a map based over overview that provides you instant insight in how the weather will develop over time, just by moving a slider. In addition to raw text, Sky provides you with and decoding Crosswind component calculation Weather radar for each station Station nd web cam images, allowing for sneek peek at the station sky Wind loft Quickly see what the winds will be like for any altitude between ground and 440 SIGs, Is and outlooks Unlike most other weather apps, Sky presents you with the full range of international Sigmets and airmets required when preparing for your next trip, and when moving the time slider Sky will also provide a sigmet outlook. ffected regions are drawn on the map along with the station summaries. You filter on any combination of Sigmets Outlooks Tango irmets Sierra irmets airmets PIEPs Use Sky to quickly see all PIEPs for the last hour. For your convenience the reports have been categorised in Turbulence, Icing and other PIEPs. Urgent pilot reports, for instance when reporting low level wind shear or heavy icing conditions, are clearly marked in red. Clouds, and tops Sky calculates the areas with relatively high cloud density. These areas are displayed in on the map where blue and yellow coloration's indicate the likelihood of icing conditions. By sliding the altitude bar you can pick an altitude that is less affected by icing conditions. quick glance in the left hand top corner of the screen show you the forecasted ambient temperature, wind and relative humidity. The latter you determine weather or not clouds will be likely at that position and altitude. Sat images and analysis. Satellite images and significant weather charts are provided to complete the weather picture. Check these links to find your download for Sky MET (free) for & iOS or for your device iPod TouchiPadiPhone. 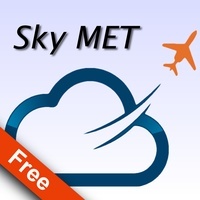 The app Sky MET (free) is compatible with te following devices.